When Rob started the Kris Gethin Trainer, his fit knowledge lacked detail. After 12 weeks of videos with the Welsh warrior, this Aussie was hooked! I have been training on and off since I was 15-years old, with various levels of success, but never really achieved anything I was happy with. I have never had a problem with gaining weight/bulking up, but with the muscle always came the fat. So in December last year I decided I needed to trim down to the physique I always wanted. Like a lot of people, I would start a program, and then give it up after a couple of weeks and try something else. Never really having a set plan, or goal that I wanted to achieve. So I made the decision to find a program and stick to it. I came across Kris Gethin's 12-week Daily Video Trainer, watched the first video, and I was hooked. 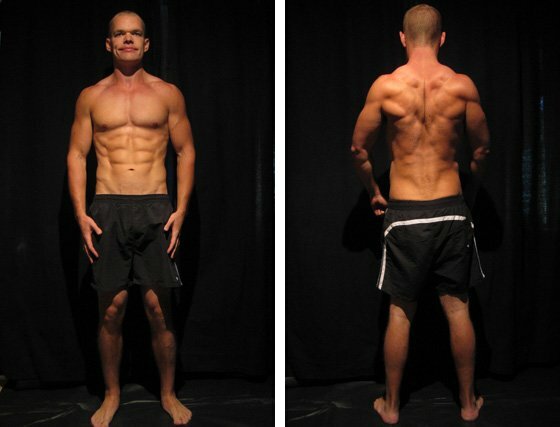 In 12 weeks, Rob intensified his life and training. 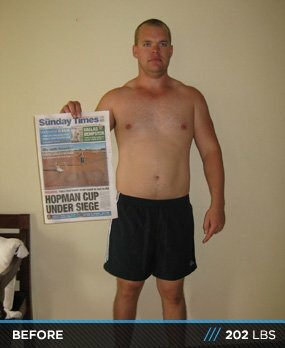 His results justify his investment in his health, his body, his future. I started Kris's program on January 1st and didn't look back. Having the daily videos made all the difference. They were the motivation and guidance that I needed. It wasn't easy at the start. The training is full-on and the diet was very strict. I wondered how I was going to last 12 weeks, but once I started seeing the results in myself and on the scales, it became easier to stay focused. No alcohol, fruit, bread or dairy for 3 months. I love all 4 of those things, so this was a very daunting task. But I did it! I ate 6-to-8 meals per day. This was hard at first, as it felt like I was over eating, but soon the metabolism kicked in, and I was hungry every 2-3 hours. For the training, please see Kris Gethin's 12-week Daily Trainer. The training changed every day, so my body was never able to adapt, allowing me to constantly build muscle and burn fat. Don't rush into this sort of program. Be prepared, and plan ahead. I found it best to plan my day the night before, making sure I knew what I had to do, and that all my meals were prepared ready to go. "If you fail to plan, you plan to fail." This could not be any more true than when it comes to a body transformation. 12 weeks is not a long time, so you can't afford to not have a plan. Thankfully Kris has done most of the thinking on this program; all you have to do is stick to it. If you want to tackle Kris's program. I would suggest watching 2-to-3 weeks worth of videos in advance. You learn lots of helpful hints as you work through program that would have been helpful earlier! Cook meals in bulk and freeze them. I found myself making 10-to-12 of the same meal, and freezing most of them. Otherwise you will find yourself in the kitchen all day trying to cook up enough food. Cook all of your meat on a "George Foreman" type health grill, so that the excess fat runs off. If you don't have one … buy one!